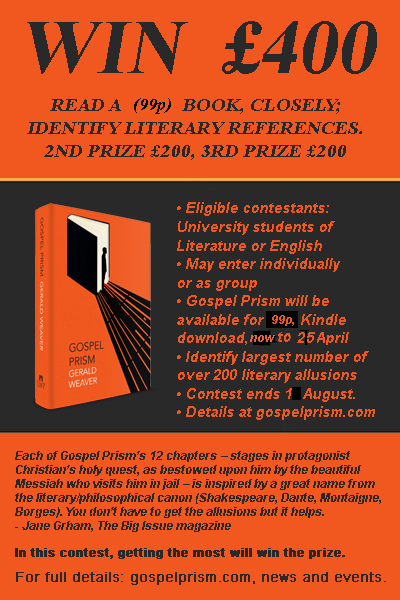 This is a contest to see who can accurately find the most literary allusions in the critically acclaimed novel, Gospel Prism. It is a skill test, for those who love the great literature to which that novel pays homage. First prize is £400, second prize is £200, and third prize is £100. Eligibility is explained below, but essentially is limited to current and recent students of Literature and English at any university in the United Kingdom. The Kindle version of Gospel Prism is currently available on Amazon.co.uk for only 99p, and will remain at that price through 25 April 2016. 1) Entry and participation in this skill contest are free. 2) The contest begins on 31 March 2016. 3) The final date on which to submit an entry is 1 August 2016. 4) No proof of purchase is required. 5) First prize is £400, second prize is £200, and third prize is £100. 6) Participation is limited to university students in the United Kingdom who are currently enrolled in a course on Literature or English, or who were enrolled in one in the most recent term. Importantly, entries may be made by individual students, or by a group of students enrolled in the same class. One student must be designated as the point of contact, and the group members named on the entry. 7) The winners will be notified within four weeks of the conclusion of the contest, and the prizes will be distributed by that time. The press announcement, and other publications, will be made only of the title of their course and the name of the university attended by the winner(s). No personal information for the individual contestant(s) will be divulged, except by the consent of the winner. Such consent is requested, but not required. The professor of the course of the winner will also be asked if the contest may divulge his or her name. 8) The copyright of the text of the winning entry will expressly extend to the contest, and the author of Gospel Prism, for the fair use of same in publication. 9) Contest entries will be submitted by email to the following address: gospelprismcontest@gmail.com. They may be submitted as an attachment, or within the body of the email, and must list name, and professor, English or Literature course, and university that serves as qualification. 10) There are more than two hundred direct literary references in Gospel Prism. Each entry must detail the following. It must clearly identify the passage in Gospel Prism, by page, (noting whether in the Kindle version or the hardcover or one of the two paperbacks.) The allusion to which it refers must be clearly stated, with reference to the work, the specific lines, and location within the work, as best as possible. An example is presented, below, at 12. 11) By simple count, the entry with the most correct references cited will be decided the winner, with second and third prizes also being awarded accordingly. In the unlikely event of a tie, the decision will go to the entry judged to be the most thorough. 12) Example: “It is a universal truth that is always acknowledged in prison that any inmate in possession of intellect and education wants desperately to be the jailhouse lawyer.” On page 132, of Gospel Prism, hardcover. Refers to the opening line of Pride and Prejudice, by Jane Austen. All questions about the contest may be directed to this email address: gospelprismcontest@gmail.com. This contest is administered by the Theory Booking Company, but is the sole legal responsibility of the author of Gospel Prism, Gerald Weaver. The laws of the United States govern the contest.